So, today was a day of work as I was visiting my University. As you've probably noticed I like adding layers of cardigans and light cotton or wool vests under my jackets to stay warm when the temperatures drop. Today the theme was different hues of blue with contrasting khaki chinos. I'm actually a huge fan of layering these kind of clothes the way I do. It is very convenient at work, as you can just hang the jacket if it is too warm and you still won't be just with your "undershirt". 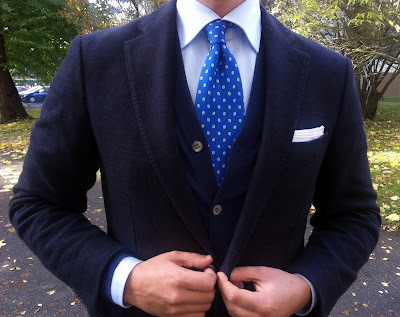 You can also create some nice contrasts between your trousers and/or your jacket. Furthermore, with different weight pieces you can pretty much work between +15 degrees Celsius and +2-3 degrees Celsius. Anyway, today I went with my navy fall jacket, a blue (it's not as dark as it looks here) cotton cashmere blend cardigan and a sky blue spread collar shirt. Pocket square is a plain white cotton square. Again with my favorite penny loafers, this time with quite bright blue cotton merino blend socks. One other thing I'd like to mention here is always remember to press your pants. It just adds just edge that is essential to any look.